LWMMG is a solid MG despite her being a 2 star unit due to her possessing an extremely well-rounded kit compared to other MGs. 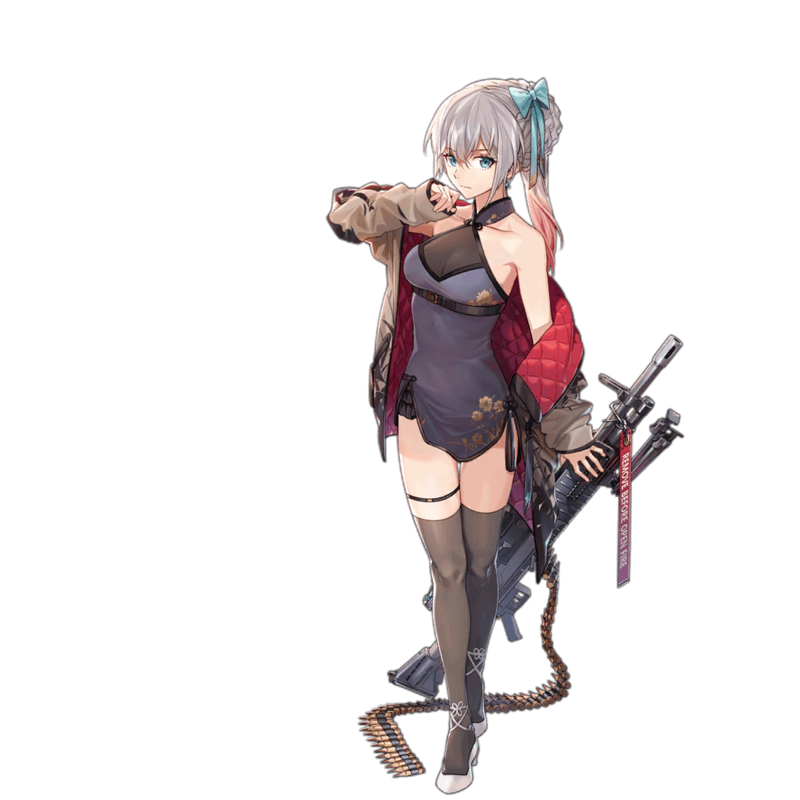 Her Skill is relatively solid for an MG mainly thanks to its 3 second Initial Cooldown; unlike most non-passive MG Skills, LWMMG’s Skill will actually see activation in battle and will boost her damage output to boot. Another positive quality of LWMMG is her stats -- while her Accuracy may be slightly below average, her Damage is one of the highest out of MGs, letting her hit harder than most. In addition, her low Accuracy is covered for within her skill. These qualities make LWMMG more effective than she may initially appear, and certainly results in her being an excellent budget MG. Even though LWMMG has a lower stat total due to her being a 2 star unit, thanks to great distribution, LWMMG has decent stats overall. LWMMG possesses a Skill with 3 second Initial Cooldown, allowing her Skill to actually see use during the battle. In addition, her Skill lets her make full use of critical hits despite the low base Crit Rate of MGs. LWMMG only has a magazine capacity of 9, making her fall behind in terms of one-volley damage compared to other MGs with a bigger magazine. LWMMG hits harder than many other MG despite her status as a 2 star thanks to her well-balanced kit. Although her stats are lower in total than higher rarity units, LWMMG’s great stat distribution means that she isn’t outpaced too badly. Many MGs suffer from ineffective stat distribution, and this is mainly due to the fact that unlike other dolls, MGs only have two important stats -- those being Damage and Accuracy. Since their other stats are essentially useless, it’s much easier to distribute stats in a poor manner on MGs, but with LWMMG, this is not the case. LWMMG’s 95 base Damage is the third highest Damage stat out of all MGs, putting her ahead of many other MGs in terms of damage output, but a problem with LWMMG’s stats is that she does have lower than average Accuracy. Due to the nature of her Skill, however, she makes up for some of her lost Accuracy through sheer firepower, and as her Skill ensures she always land critical hits regardless of Crit Rate, and she can comfortably use EOT Sights in order boost her Accuracy and Damage. The only real disappointing aspect to LWMMG’s kit is her low magazine capacity of 9, which is a much bigger disadvantage compared to some other MGs than her low Accuracy is. The importance of magazine capacity is demonstrated in how FG42 is considered a bad MG while LWMMG is considered decent -- with the difference of 1 shot, LWMMG does over a thousand additional damage. LWMMG’s main merit, however, comes from the fact that her Skill further balances out her kit. Because of its 3 second Initial Cooldown, LWMMG’s Skill can reliably activate in practically all battles, already putting her ahead of many MGs with 8 second Initial Cooldowns. Her Skill itself is also great, boosting her Accuracy by 60% which makes up for her low Accuracy stat, and. it additionally makes all her shots crit for 6 seconds, guaranteeing she deals 1.5x additional damage. Another thing to consider about LWMMG’s Skill is that the only aspect of it that changes with rarity is the potency of the Accuracy buff, which isn’t as important as the guaranteed critical hit. This means that LWMMG isn’t as clearly outclassed by dolls with the same Skill but higher rarity, as her stat distribution is arguably more important. To conclude, LWMMG is an amazing MG despite being a 2 star unit, outperforming many other, higher rarity MGs due to her excellent stat distribution and Skill. As far as budget MGs go, one could do much worse than her -- making her an excellent choice for the core-conscious. LWMMG, like other MGs, appreciates only Accuracy and Damage buffs. 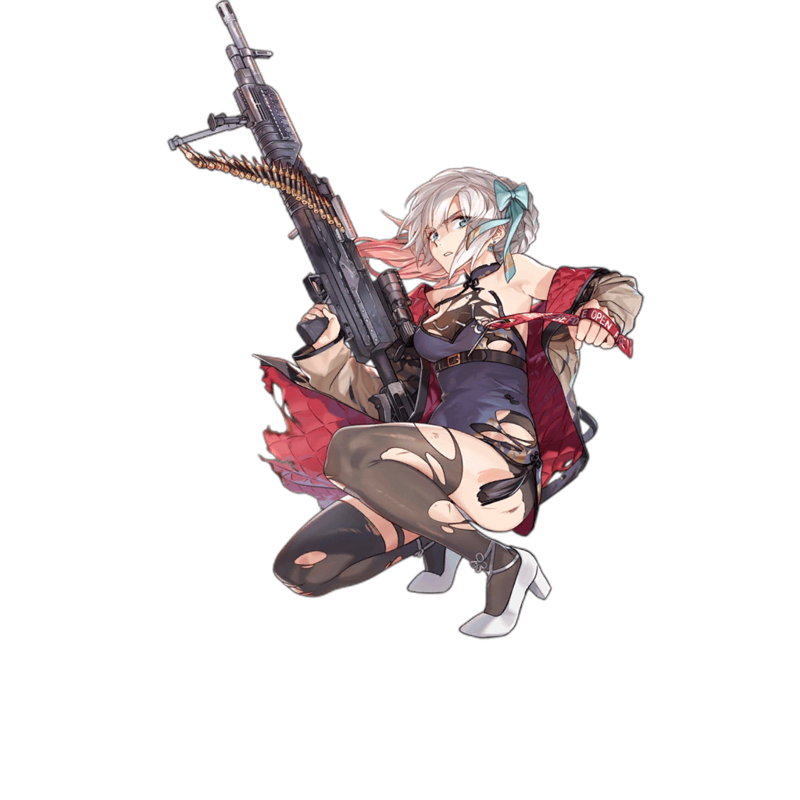 LWMMG, despite her low base Accuracy, actually has less of a need for Accuracy buffs, as her Skill combined with an EOT Sight brings her Accuracy to levels where Accuracy buffs start to show diminishing returns. Some possible SGs to pair with her, then, are KSG and M37 who will buff her Damage instead. As stated above, LWMMG hits high enough Accuracy with her Skill and EOT Sights to not need Accuracy buffs, and therefore Damage buffs are preferred. Examples are SAA, Grizzly, and Mk23. As MGs have no bearing on each other and LWMMG has no glaring weaknesses, she can be paired up with any other MG. A few examples are MG5, PKP, and PK. As LWMMG’s tile buffs don’t really matter to SGs, she can be placed anywhere in the Echelon comfortably as long as she’s within range of the SG/HG’s buff tiles. Like the 1SG formation above, LWMMG can be placed anywhere in a 2SG formation as well, as long as she is within range of the buffs of an SG. The Lightweight Medium Machine Gun, or the LWMMG, is a gun under development by General Dynamics. The idea for the LWMMG was derived from the problems American troops were facing in Afghanistan -- they were often engaged in battles where the enemy had the high ground, yet most machine guns could not shoot well in vertical directions. The LWMMG was therefore developed to be lighter and have further range in order to suit these conditions better.